If you have FUN programming Excel, on a SATURDAY…You MIGHT be a Redneck I mean, you might be a PCHEMIST. Years ago, I was at home on a Saturday fiddling with a wave function problem in Excel. 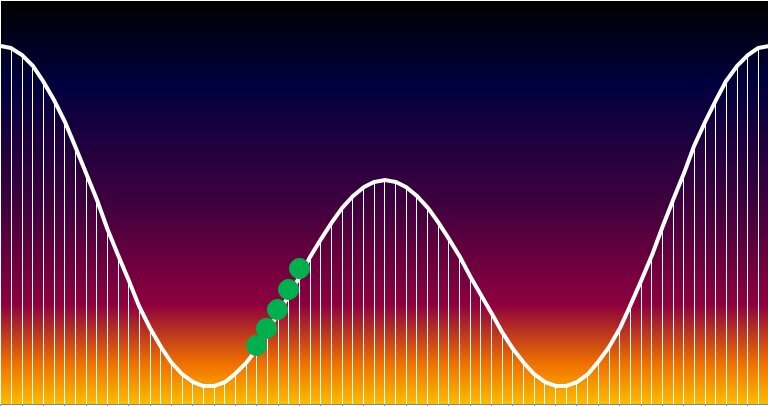 The plot on the screen was of a couple of cosines, and my 8-year-old son said, “Hey that looks like a roller coaster”. So over the next four hours we had some quality father son time making a roller coaster in Excel. He learned something about cosine functions, and how to put custom backgrounds on a chart. Some of the finer details he did not care much for were anchoring cells, negative error bars, or the mod() function. But he really appreciated the custom look of a white wooden roller coaster and the looping macro that made the coaster run along the track. You can download the macro-enabled (.xlsm) workbook file from my curiosities page to see how these functions and settings were used. Here is a time-lapse video of my creating the page from scratch. There are some fun tricks so I hope you enjoy it. the background loop is a bit annoying. Sorry. The coaster uses an infinite loop. To kill it just click Ctrl+Break, and it will stop. What Excel awesomeness to you have to share? What questions do you have about these functions and settings in this fun application? Ask in the comments field, and subscribe for more fun in the future (like my Sudoku solving spreadsheet).